One journalist described it as a chance "to see justice catch up with evil." 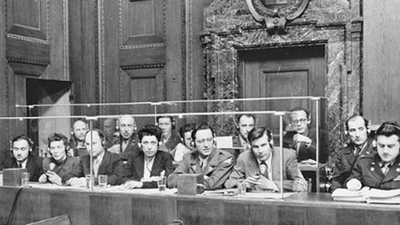 On November 20, 1945, the twenty-two surviving representatives of the Nazi elite stood before an international military tribunal at the Palace of Justice in Nuremberg, Germany; they were charged with the systematic murder of millions of people. The ensuing trial pitted U.S. chief prosecutor and Supreme Court judge Robert Jackson against Hermann Göring, the former head of the Nazi air force, whom Adolf Hitler had once named to be his successor. Jackson hoped that the trial would make a statement that crimes against humanity would never again go unpunished. Proving the guilt of the defendants, however, was more difficult than Jackson anticipated. This American Experience production draws upon rare archival material and eyewitness accounts to recreate the dramatic tribunal that defines trial procedure for state criminals to this day. "The wrongs which we seek to condemn and punish have been so calculated, so malignant and so devastating that civilization can not tolerate their being ignored, because it can not survive their being repeated." Narrator: The year World War II finally ended, a courtroom in Nuremberg, Germany, became the scene of what would be called the greatest trial in history. For the first time, leaders of a nation would be tried for war crimes. Chief prosecutor Robert Jackson declared, "We will show these men to be the living symbols of racial hatred, terrorism and violence, and of the arrogance and cruelty of power." The highest ranking Nazi to survive the war, Hermann Göring, was the lead defendant. "Everybody knows this is not a trial," Göring proclaimed. "This is just an arrangement where the victors will take revenge on the defeated." Six years of war had left 55 million dead. Now, in Nuremberg, before the eyes of the world, the victorious Allies would attempt to stay the hand of vengeance, and follow a difficult and uncertain path to justice. On November 20, 1945, the elevator in Nuremberg's Hall of Justice rose slowly from the cellblock to the courtroom. Hermann Göring, founder of the Gestapo and heir apparent to Hitler, strode confidently into the prisoners' dock, followed by the Commander of the German Navy, Admiral Karl Doenitz, Nazi party secretary Rudolf Hess and 18 other leaders of Adolph Hitler's Third Reich. Supreme Court Justice Robert Jackson would lead the American prosecution team. Jackson was determined that the Nazis pay for their crimes, yet fearful that Hitler's henchmen could use this high-profile forum to re-ignite Nazism in Germany. In a courtroom flooded by lights for the newsreel cameras, five hundred spectators and 21 defendants -- some shielding their eyes from the glare behind dark glasses -- waited for the unprecedented trial to begin. 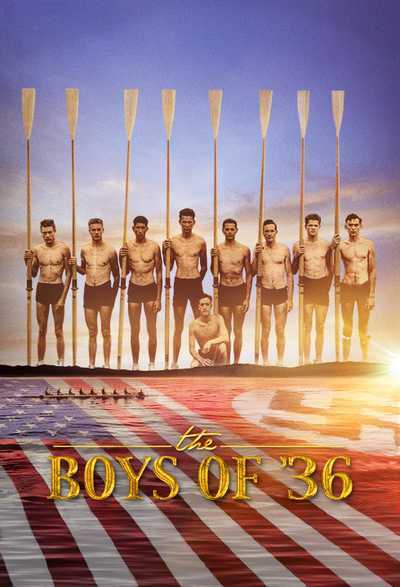 Walter Cronkite, Journalist: Sitting there for the first time and seeing these 21 men who had caused such horror in the world I actually felt sick, kind of. They had come into the dock as if this was not a fair proceeding, as if they knew they were going to hang already, why go through this whole thing. Narrator: As the eight judges, led by Lord Geoffrey Lawrence of England -- took their places on the bench, the air was thick with anticipation. The international tribunal was empowered to decide the fate of each defendant -- including a sentence of death. The first to enter his plea was Hermann Göring. "Before I answer the question of the court, whether I plead guilty or not guilty..."
"Responding to the indictment I plead not guilty." William Jackson: That was an indication of his ability of try to find an opening to present what he wanted to say rather then what he was being asked. Narrator: Each defendant pleaded "not guilty." Robert Jackson then made his way to the podium. He had labored over his opening statement for weeks. Robert Jackson (archival): "The privilege of opening the first trial in history for crimes against the peace of the world imposes a grave responsibility. ... The wrongs which we seek to condemn and punish have been so calculated, so malignant and so devastating that civilization can not tolerate their being ignored, because it can not survive their being repeated." Whitney Harris, Prosecutor: That set the tone not only for the speech which followed but for the entire trial. This was not a trial of Germans alone. This was a trial for humanity. This was a trial to prevent tyranny from raising its head again in any place in the world. Narrator: The trial unfolding in Nuremberg was not without controversy. In the months leading up to Allied victory, voices calling for vengeance had been numerous and forceful. As the long and bloody war in Europe was winding down, Allied leaders began to address what should be done with the Nazis. When the Allies met in Yalta in February 1945, British Prime Minister Winston Churchill favored swift executions of top Nazi leaders. Soviet Premier Joseph Stalin preferred show trials, followed quickly by mass executions. President Franklin Roosevelt -- his health failing badly -- was hearing conflicting opinions from his cabinet. Roosevelt's influential Treasury Secretary, Henry Morganthau -- Jewish, and enraged by Nazi atrocities -- argued for summary executions of those he called "the arch criminals of this war." Secretary of War Henry Stimson was adamant that Nazi leaders be put on trial. "The punishment of these men in a dignified manner," Stimson wrote, "will have all the greater effect upon posterity. "Stimson advanced a plan developed by a young Jewish lawyer on his staff, Murray Bernays, to try the Nazi leaders as a criminal conspiracy -- like an organized crime syndicate. 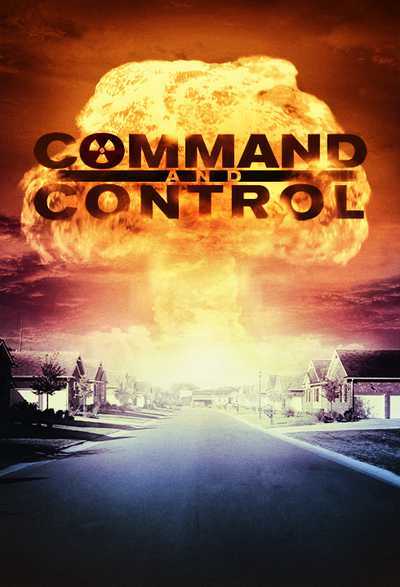 "The atrocities were not single or unconnected", wrote Bernays, "but were the inevitable outcome of a conspiracy based on the Nazi doctrine of racism and totalitarianism." Whitney Harris: That was the concept that we would charge these leading defendants with conspiring, getting together and plotting to seize control of the German government and subjecting the German people to its dictatorial control, making the German people themselves victims if you like and eliminating freedom in Germany, eliminating democracy, establishing a ruthless dictatorship and then, having done that -- that's the conspiracy -- then committing the crimes that they did in the name of the German people. Martha Minow, Professor of Law: It was difficult for the political figures to come to the view that after this rather brutal and longout war that something as refined and patient as a legal process should be pursued, but if someone is a prisoner of war, they are not supposed to be executed and, indeed, they are supposed to be given considerable protection. So it would have violated at least the best versions of American law and British law to have summary executions. Narrator: Roosevelt came to favor the Stimson/Bernays plan, but in April, he died. His successor, Harry Truman, asked Robert Jackson, an Associate Justice of the Supreme Court, to serve as chief U.S. prosecutor for the war crimes trials. Jackson was wary. The trials would explore uncharted legal territory; convictions were by no means certain. "You must put no man on trial," Jackson warned, "if you are not willing to see him freed if not proved guilty. If we want to shoot Germans as a matter of policy, let it be done as such. But don't hide the deed behind a court." John Barrett, Jackson's Biographer: Jackson hears from collegues at the Supreme Court and friends and contacts in the government, and he encounters a lot of skepticism about the time and difficulty of accomplishing this, skepticism about the benefits at the end of the process in terms of justice, in terms of deterrence. Narrator: Still, Jackson was drawn to the challenge. The son of a small town businessman, Jackson never attended college. He had risen to become attorney general, then a Supreme Court justice. John Barrett: Robert Jackson was a lawyer's lawyer at each stage of his career. For twenty years in private practice, trials and appeals and tremendous success. And then Jackson on the bench of the Supreme Court being a very active and witty and colorful speaker in the courtroom and thinker and writer in his opinions ... so this was an enormous legal figure. Narrator: Now, at age fifty-three, Jackson exuded self-confidence and ambition, and was frustrated at being on the sidelines during World War Two, the century's great drama. On May 2, he accepted Truman's offer. ALT: having been on the sidelines... .
Robert Jackson: "I am convinced that we have an opportunity to bring to a just judgement those who have thought it safe to wage aggressive and ruthless war." Narrator: The Supreme Court would soon adjourn for the summer. Jackson was sure he'd be back in time for the fall session. But he also knew that the trials would be controversial, and might hurt his chances of one day being named Chief Justice. As Jackson assembled his legal team in Washington, the U.S. Army was gathering evidence of Nazi atrocities-the extent of which were finally being understood: the use of slave labor; the horrific extermination camps; the millions of murdered Jews. Benjamin Ferencz, U.S. Army Investigator: I was coming in there to prove the crimes. We would come in. We would prepare a list of the evidence, proof of what transports had come into the camp, how many people had been registered as being killed on the various dates, the supposed cause of death -- which was obviously fictitious, such as "Auf der Flucht erschossen," shot while trying to escape ... listing some disease page after page." My mind just refused to grasp what my eyes saw, these people who were lying in the dirt -- mostly you couldn't tell whether they were dead or alive. They didn't look like human beings, many of them; they looked animal-like, almost. Or like skeletons. Narrator: On May 6, 1945, Reichsmarshall Hermann Göring surrendered to American troops. He had brought his prized possessions -- 17 truckloads worth -- and expected to be treated like a dignitary. 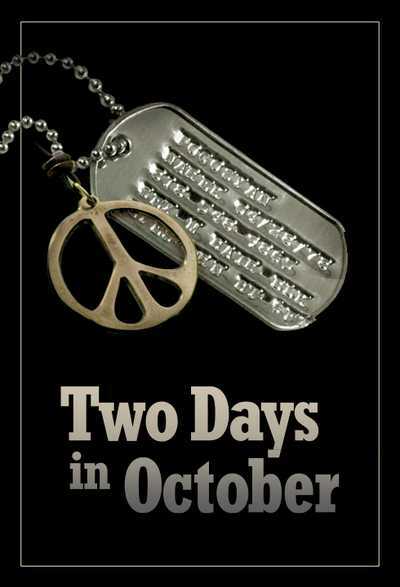 "War is like a football game," he remarked, "whoever loses gives his opponent his hand, and everything is forgotten." Göring had been one of the most conspicuous and notorious figures in Germany. A flying ace in WWI, he had taken over command of Hitler's bodyguards, the SA, in 1922. The following year, he became addicted to morphine while recovering from injuries sustained during a failed Nazi coup. His addiction led to manic-depressive behavior that twice forced him to be hospitalized. After Hitler seized power in 1933, Göring was at the center of everything. He established the secret police, the Gestapo, instituted concentration camps for political opponents and commanded the Luftwaffe, Germany's air force. Some in Hitler's inner circle thought Göring mentally unstable, but he soon became the Fuhrer's second-in-command. He was cunning, ostentatious, larger-than-life- regarded by many as the "Sun King" of the Third Reich. He changed clothes several times a day, favoring brightly colored jackets, gaudy jewelry, and archaic Bavarian hunting outfits. In his estate outside Berlin, Göring lived a life of luxury, surrounded by exotic pets and stolen art treasures, as he spearheaded the build-up of the Nazi war machine. Now he was the highest ranking Nazi prisoner of war. Hitler and his propaganda chief, Joseph Goebbels, had killed themselves. When the Nazis were put on trial, Hermann Göring would be defendant number one. The day after Göring turned himself in, Germany surrendered. Now, Robert Jackson could send in civilian investigators to search for a paper trail of Nazi crimes. The results were stunning. Whitney Harris: I visited many Gestapo offices and I found documents lying around on the floor, saying "this man should be executed." and I picked them up off the floor. There were many many documents that were not destroyed that we obtained and were incriminating. Narrator: "I did not think men would ever be so foolish," Jackson wrote, "as to put in writing some of the things the Germans did. ... The stupidity and the brutality of it would simply appall you." In June, Jackson flew to London to establish the ground rules for the International Tribunal, joining counterparts from France, Great Britain and the Soviet Union. He was unsure how difficult the negotiations would be, but expected them to be brief. The Allies quickly came to agreement on a key point: the tribunal would not allow the Nazis to defend their actions by claiming the Allies had also committed crimes, such as killing civilians by carpet bombing German cities. They just came up with kind of a blanket rule: we will find it no defense to say 'but you did it too.' It is no defense to murder to say that other people have murdered. Narrator: But the talks soon bogged down. The Soviets wanted speedy trials; prosecutors would simply outline charges and judges hand down sentences. Jackson insisted there be time for the accused to defend themselves, and that judges be free to determine guilt or innocence. He reminded everyone the United States held most of the Nazis to be tried -- and the evidence to be used against them. After a month of tough negotiations, he prevailed. The trials would be conducted on Jackson's terms. 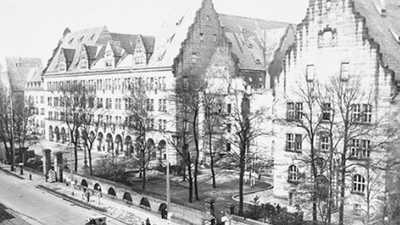 In July, Jackson flew to the Army's choice of a location for the trials, the ancient southern German city of Nuremberg. William Jackson: It was devastated, totally devastated. The rubble was everywhere, the buildings were down. Those that were standing were gutted, the stench of bodies was in the air. However, the Palace of Justice was standing and was relatively undamaged. Narrator: Though the largest courtroom was in disarray, Jackson was sure it could be restored to its former grandeur in time. And the symbolic value of this place was undeniable: Nuremberg had been the cradle of Nazism. Between 1933 and 1938 the Nazis had held massive Party Rallies in Nuremberg every September. It was here that Hitler displayed his growing power. The city's history appealed to Jackson. Where it all began, it was to end. Narrator: In August newsreels brought the unfolding story of the Nuremberg trials to movie screens across America. Newsreel Announcer: ...and the shrine of Hitler's Nazism becomes its tomb. 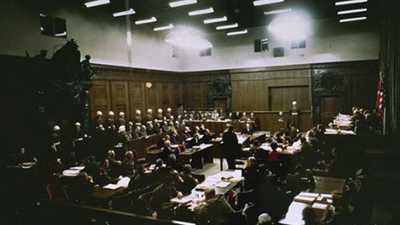 In Nuremberg's court building, were the trials will be held, German prisoners work on enlarging and rebuilding the courtroom. Under American supervision they install broadcasting booths and press facilities to carry the proceedings throughout the world. Robert H. Jackson, Associate Justice of the United States Supreme Court, made preliminary arrangements for the trial. From the jail to the courtroom a covered corridor has been erected. The war criminals will be screened from site exept in the courtroom, protected and safe for the disposition of United Nations justice. The big names of Hitler's Third Reich are kept under heavy guard. Narrator: Behind the palace of justice loomed a massive prison, capable of holding 1200 detainees. The first group of Nazi defendants was brought to the prison on August 12. Each prisoner was housed in a separate cell and not permitted to speak except during interrogations. Göring's cell was tiny and barren. He was allowed only a few books to pass the time. His garish clothing and jewelry were now in the hands of the U.S. Army. Jackson met with him briefly that September. He found that Göring was no longer addicted to morphine. The Nazi warlord was fit, focussed, lucid and fiercely unapologetic. Jackson knew he was up against a formidable adversary. John Barrett: Jackson's concern was that the defendants and Göring first among them would use it as a platform to stimulate some resurgence of Nazism in Germany, that this was a virus that was not dead, that the defeat and the death of Hitler did not mean forever the end of Nazism, and that Jackson was dealing with a very volatile dangerous prospect of the Nazi future as he dealt with these defendants. Narrator: Since accepting his assignment, two things had become clear to Robert Jackson. He would not get back to the Supreme Court for its fall session. And the trial that lay before him would be the most difficult of his life. On October 19 , 1945, the German leaders held in the cellblock of Nuremberg were indicted for the crimes the Allies had agreed upon: conspiracy to wage aggressive war; the waging of aggressive war, known as "crimes against peace;" war crimes, such as mistreatment of prisoners; and "crimes against humanity," which included what later would come to be called "genocide" and "ethnic cleansing." Göring was indicted on all four counts. Richard Sonnenfeldt: Göring was very businesslike. He was not visibly upset. He still radiated this feeling this is nothing but a charade but a show, a victory of the victors. Some of the others were shocked, but Göring showed no obvious sign of shock at all. Robert Jackson, opening speech: "The wrongs which we seek to condemn and punish have been so calculated, so malignant and so devastating that civilization can not tolerate their being ignored, because it can not survive their being repeated." 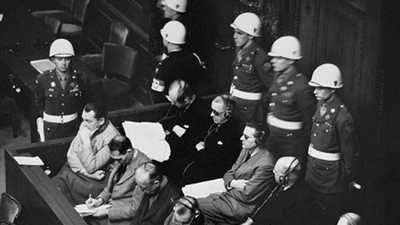 Narrator: On November 21, the packed courtroom in Nuremberg fell silent as Robert Jackson opened the case against the Nazis with a speech of nearly four-hours. Robert Jackson: "That four great nations flushed with victory and stung with injury stay the hand of vengeance and voluntarily submit their captive enemies to the judgement of the law is one of the most significant tributes that power has ever paid to reason." John Barrett: The power of it was immediate and enormous. The defendants were sort of knocked back in the box and were very depressed lot as they returned to their lunch room in the middle of it and to their cells at the end of the day, because this was really their first experience of Jackson in action in the courtroom and in a new way they understood that they were up against it. Narrator: "My spine throbbed," William Shirer of CBS News noted, "as Jackson used the power of language to build up his masterly case against the Nazi barbarism. We have heard today one of the great trial addresses of history." The next day, prosecutors began introducing evidence contained in the stacks of documents now filling several store rooms in the Palace of Justice. They cited the darkest and most incriminating of the thousands of orders issued by the Nazis. The process was tedious. Jackson feared the trial would get bogged down. Each document had to be read in its entirety and translated into four languages. John Barrett: Jackson is sitting there through it and the tribunal's requirement about how the documents have to be read before they can be accepted into evidence, the delay caused by the translation system is a kind of numbing that he is experiencing too. He is quickly persuaded that other types of evidence, particularly film evidence should be played sooner rather than later as a way of dramatizing and pumping up the proceedings a little bit. Narrator: One day early in the trial, Jackson projected a film made from clips of German propaganda. It showed how the Nazis had systematically violated treaties, rearmed Germany, and attacked neighboring countries with the criminal intent to subjugate and pillage them. When the lights came up, Göring was ecstatic: "They don't have to show films to prove that we rearmed for war," he boasted, "Of course we rearmed! I rearmed Germany until we bristled!" The film had been so rousing, Göring declared, that prosecutor Jackson would now surely want to join the Nazi party. Göring's mood was noticeably different when another film was shown as evidence of crimes against humanity." Original sound (archival): "Dachau -- factory of horrors. Dachau near Munchen, one of the oldest of the Nazi prison camps. The Nazis said it was a prison for political dissenters, habitual criminals, and religious enthusiasts. This is the Brausebad, the shower bath. Inside the shower bath: the gas vents. On the ceiling: the dummy shower heads. Cyanide powder was used. This was Bergen-Belsen." Walter Cronkite, Journalist: As soon as the defendants saw the pictures, the film of the concentration camps, they began to wither. As a matter of fact several of them cried. They weren't crying, I don't think, for the Jewish people that were lost. They were crying because they knew that, when those pictures were seen in the world they had no way to escape execution. Narrator: One member of the prosecution team who had urged Jackson to use films was Thomas Dodd. 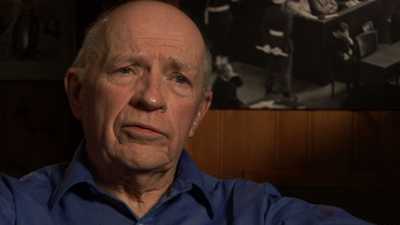 An experienced lawyer from Connecticut, Dodd was a former FBI man with a flair for the dramatic. What he had learned while preparing for the trials horrified him. Senator Christopher Dodd, Son: The inhumanity just stunned him. My father talked a lot, the lessons of it. He felt very strongly that we ought to be well informed as a generation of what can happen, and well educated, sophisticated people, when things go wrong and people can do things they never could think about doing and they did, and he wanted us to be very conscious of that. Narrator: On December 13, Dodd presented shocking evidence of Nazi crimes against humanity. Thomas Dodd (archival): "The Nazi conspirators were generally meticulous record keepers, but the records which they kept about concentration camps appeared to have been quite incomplete. Perhaps the character of the records resulted from the indifference which the Nazis felt for the lives of their victims, but occasionally we find a death book or a set of index cards"
Narrator: As Dodd spoke, all eyes were riveted on a small table covered with a white sheet that he'd placed in the front of the room. Dodd (archival): "For the most part, nevertheless, the victims apparently faded into an unrecorded death." Narrator: Finally the shroud was lifted. Dodd (archival): "This exhibit which is on the table is a human head with its skull bone removed, shrunken, stuffed and preserved. The Nazis had one of their many victims decapitated after having him hanged apparently for fraternizing with a German woman." Narrator: The shrunken head had been used as a paperweight by the commandant of Buchenwald concentration camp. The courtroom was aghast. Dodd: When we are talking statistics nobody pays much attention, but if I can show you one person who gets murdered you're more apt to pay attention to that. And my father by boiling this stuff down to in that particular case, one of the atrocities, one individual. If I talked about thousands who lost their lives in Buchenwald, your eyes might glaze over. I hold this up in my hand and say 稚his is what happened, even for a seasoned judge it's hard to ignore that. Narrator: One of the biggest challenges for Jackson and his team was linking individual defendants to Nazi crimes. "It would be relieving to hear one of them admit some blame for something," Dodd wrote to his wife. "They blame everything on the dead or the missing." Zeroing in on Nazi leaders, the prosecution called General Erwin Lahousen, an officer in the German intelligence unit who'd participated in a key meeting with Hitler to plot the invasion of Poland. "Do you also see Keitel in the courtroom?" "Ja, er ist neben Ribbentrop." "Yes, he is next to Ribbentrop." "Now to the best of your knowledge and recollection, will you please explain what took place at this conference in the Fuehrer's train?" Narrator: Lahousen recalled a meeting in September 1939 when the destruction of Warsaw was planned. Hitler and Göring called for the German air force to bomb the Polish capital on the heels of the invasion. 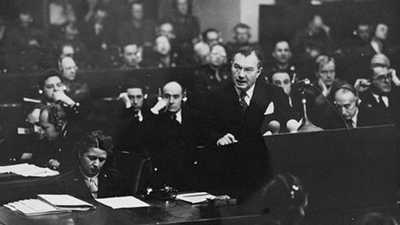 Lahousen's testimony connected Göring explicitly to the launching of a war of aggression -- a crime against peace. Narrator: Jackson's team then began to lay out its case that Göring had committed crimes against humanity over the course of a decade. In September 1935, the organized persecution of Jews in Germany intensified with Göring's proclamation of the "Nuremberg Laws." Eheschlieﾟungen zwischen Juden und staatsangehigen deutschen oder artverwandten Blutes sind verboten!" Marriages of Jews and persons of German or German-related blood are prohibited!" Göring did many many things that nobody else would dare do because he was an enormous power in Germany. Göring made also the decision that I say who is Jewish. Narrator: Prosecutors described how Hitler and Göring began excluding Jews from the economic activity of Germany, driving many out of the country, stripping them of their belongings. 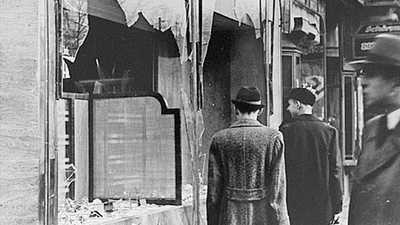 Narrator: On November 9, 1938 -- Kristallnacht, the night of broken glass -- raging mobs burned synagogues across Germany. Over 8,000 Jewish businesses were destroyed, and at least 91 Jews killed. Narrator: Following Kristallnacht, Hitler made Göring the coordinator for the "the Jewish question." He disallowed insurance claims by Jews who'd lost property to arson and looting. The victims themselves must pay for the damages, he declared. Arno Hamburger: The Jews had to pay for the value that was destroyed. They had to pay one billion Reichsmark in order to atone for their sins for having permitted those values to be destroyed. That was Göring's order. Narrator: The most damning evidence against Göring was a document from July 1941 authorizing the "final solution of the Jewish question" -- the systematic murder of all European Jews. Richard Sonnenfeldt, Interpreter: We said to Göring: 'Did you issue this and did you sign it?' And he said: 'How do you expect me to know anything about a little old document out of Wurzburg?' And we said: 'well, it happens to have your name on it. Narrator: On January 3, 1946, prosecutors called S.S. officer Dieter Wisliceny to the stand. Wisliceny described how - in the wake of Göring's order -- he had helped to organize the deportation of Jews to extermination camps. Prosecutor Smith Brookhart, questioning: "What became of the Jews to whom you already referred, the approximately 450.000?" "They were all brought to Auschwitz and were part of the final solution." "You mean they were killed?" "Yes, except about 25 to 30 percent, that were used for labor purposes." Narrator: Göring was infuriated that his countrymen had testified against him. "It is sickening," he raged, "to see how Germans sell their souls to the enemy." During the first two months of 1946, French, British, and Soviet prosecutors added to the case the Americans had laid out. Then, in March, the defense phase of the trial began. Göring was called to the stand by his German defense attorney on the 13. Jackson feared that the judges wouldn't rein Göring in, giving him a stage from which to defend and glorify Nazism. Walter Cronkite: He was arrogant, considerably arrogant. There was no attempt to placate the courtroom. He was telling his story his way, and of course in telling the story he was justifying what had happened as best he could. Pretty hard to justify that, but he was skipping over the worst, and defending the need for the Third Reich at the time it came. G&oml;ring, testimony (translation): "Me personally, and I can only speak for myself, did everything, that was within the limits of my power, to strengthen und enlarge the national socialist movement, and worked relentlessly, to bring it into power, meaning the sole and unlimited power." Narrator: Göring testified on his own behalf-that he'd only been serving the best interests of Germany, that all his actions had been to protect his homeland. For five days, he held the courtroom in thrall. Jackson knew he needed to regain control. John Barrett: Jackson is not very worried about carrying his burden of proof on the crimes charged. He doesn't need confessions from Hermann Göring. They have an extensive documentary record including many things Göring had signed. But Jackson is very concerned about not letting Göring rally the German people to a renewed enthusiasm for Nazism. With hindsight I think that was greatly exaggerated, it wasn't the danger that they thought, the German people were not poised to fight again or somehow elevate Herman Göring as a future leader. It was a depressed, beaten, desperate, starving country without a government, is really what the situation was outside the courtroom.But in the courtroom they didn't fully understand that. They had an exaggerated sense of the danger, politically, that Göring posed as a witness. 59 Narrator: The Palace of Justice was jam-packed when, on March 18, Robert Jackson began his cross-examination. Jackson, cross-examining G&oml;ring: "I want to get what's necessary to run the kind of a system that you set up in Germany and concentration camps was one of the things you found immediately necessary upon coming to power, was it not? And you set them up as a matter of necessity as you saw it?" G&oml;ring (translation): "You asked me if I considered it necessary to establish concentration camps immediately in order to eliminate opposition. That is correct." Whitney Harris: As Jackson pressed him Göring saw what was going on and he became very wordy and evasive. His answers were long explanations. He would say well, you do the same thing in the United States, in Great Britain and so forth, and there is no difference and so forth. Jackson, question: "But all of these things were necessary things, as I understood you, to protect...?" Göring, answer (translation): "Yes, these things were necessary because of the opponents that existed." Jackson, question: "I assume that is the only kind of government that you think can function in Germany under present conditions?" Göring, answer (translation): "Under the conditions existing at the time, it was, in my opinion, the only possible form, and it also demonstrated that Germany could be raised in a short time from the depths of misery, poverty, and unemployment to relative prosperity." John Barrett: The press, like Jackson himself, has a sort of prize fight mentality about the event that they were watching. 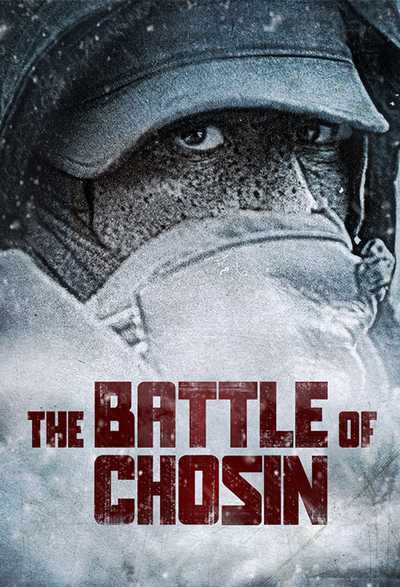 They expected another knockout, a crushing blow, a collapse, a confession, something of that dramatic order. Instead what they saw was a great lawyer running into a great powerful and brilliant witness and a combative examination that was something of a draw whenever they tried to talk about the great topics of the ultimate questions. "Let's omit that, I haven't asked for that. If you will just answer my questions we shall save a great deal of time. You did prohibit all court review and considered it necessary to prohibit court review of the causes for taking people into what you called protective custody? That is right, isn't it?" "That I answered very clearly, but I should like to make an explanation in connection with my answer ..."
Whitney Harris: Justice Jackson then sought the help of Chief Justice Lawrence in restricting Göring to making direct answers to Jackson's questions. "The difficulty is: the tribunal looses control of these proceedings, if the defendant in a case of this kind, where we all know that propaganda is one of the purposes of the defendant, is permitted to put his propaganda in, and then we have to meet it afterwards." Unfortunately it happened Lord Lawrence, who was the Chief Judge, sensitive to history itself elected to allow Göring pretty much unlimited freedom in his responses. Narrator: "Göring obviously enjoyed himself" a reporter for Life Magazine wrote. A judge observed that "Göring quickly saw the elements of the situation, and as his confidence grew, his mastery became more apparent. Jackson looks beaten and dead tired." The first day of cross-examination ended triumphantly for Göring. He had answered the chief prosecutor's questions calmly and directly, and the tribunal had allowed him to launch into several self-serving orations. Jackson was furious. But as the second and third days of cross-examination unfolded, Jackson gradually gained the upper hand as, point by point, he listed Göring's crimes, and verified each with evidence. Whitney Harris: When we got Göring into the matter of the specific crimes that he committed such as the persecution of the Jews, well, then he collapsed, then he collapsed. He was a done witness, I'll tell you, because we had him so devastated on the Jewish issue that he had nothing so say. Jackson, question: "You, Hermann Göring, published a decree, imposing a fine of a billion marks for atonement on all Jews?" Göring (translation): "I have already explained that all these decrees at that time were signed by me and I assume responsibility for them." Jackson: "It was you, was it not, who signed a decree to make the plans for a complete solution of the Jewish question. That document is signed by you, is it not?" John Barrett: Göring then leaves the stand not the next Fuehrer, which had been Jackson's fear, and he leaves the stand convicted by his own admissions, which was Jackson's immediate objective. So, with a sort of sober endpoint assessment an observer, I think, could understand that this had not been a good day, a good series of days for Göring. Narrator: Over the next four months, most of the other Nazi leaders testified in their own defense. Some claimed they had merely been following orders; a few admitted responsibility for crimes. The defense finally rested on July 25, 1946. The next day, Robert Jackson delivered his long-anticipated closing argument. "Mr. President and members of the tribunal. It is impossible in summation to do more than outline with full strokes the vitals of this trial's mad and melancholy record, which will live as a historical text of the twentieth century's shame and depravity. It is against such a background that these defendants now ask this tribunal to say, that they are not guilty of planning, executing or conspiring to commit this long list of crimes and wrongs. They stand before the record of this tribunal as bloodstained Gloucester stood by the body of his slain king. He begged of the widow, as they beg of you: 痴ay I slew them not!' And the queen replied: 稚hen say they were not slain, but dead they are.' 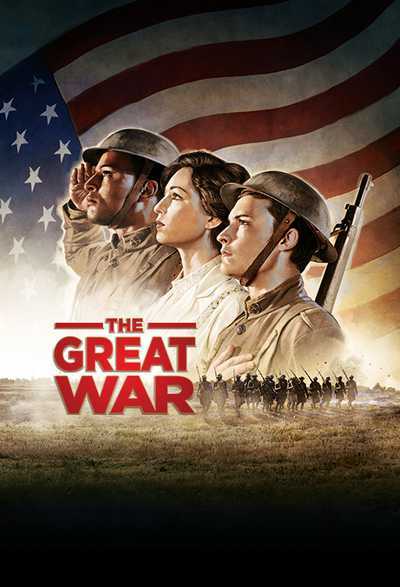 If you were to say of these men that they are not guilty it would be as true to say, that there has been no war, that there are no slain, that there has been no crime." Narrator: On September 2, after 216 days in court, the international tribunal retired to deliberate the fate of the accused. Four weeks later, the defendants were brought up to the courtroom for the last time. The overflow crowd hushed in anticipation as Lord Lawrence read out the judgements the tribunal had reached. Verdict being read: "Defendant Hermann Wilhelm Göring, on the counts of the indictment on which you have been convicted the International Military tribunal sentences you to death by hanging. Defendant Rudolf Hëss, on the counts of the indictment ..."
Narrator: Göring and ten others were to hang. Seven defendants received prison sentences. Three were acquitted. Göring's wife and daughter were allowed a final visit. Emmy Göring believed that they would never hang her husband but intern him on an island, like Napoleon. Göring demanded a firing squad -- an execution, he thought, more befitting his rank. "They will not hang me", he vowed. His request was denied. At 10:45 p.m. on October 15 -- two hours before Göring was to hang -- a guard noticed him put an arm to his face and begin to choke. He had managed to get hold of a capsule of potassium cyanide. Within a few minutes the Nazi warlord was dead. "I decided to take my own life," Hermann Göring had confided in a letter to his wife, "lest I be executed in so terrible a fashion by my enemies". Narrator: His body was taken secretly to Munich and burned. His ashes scattered in a local river. Over the next two and a half years the courtroom in Nuremberg saw twelve more trials of another 184 Nazi officials, including physicians, judges, bankers and industrialists. Twenty-four were sentenced to death. Robert Jackson returned to the U.S. Supreme Court after the first trial, where he served until his death in 1954. He was never appointed chief justice. Jackson's hope that an international system of justice would deter war crimes and crimes against humanity has yet to be realized. But Nuremberg did establish an important precedent: those responsible for atrocities -- even heads of state -- could be brought to trial. And if the hand of vengeance were stayed, justice could prevail over evil. Raymond D'Addario assigned by the U.S. Army to photograph the Nuremberg War Trials from 1945 to 1946. D'Addario also spent time in the former Nazi capital of Berlin, which was occupied by Soviet, American, British and French troops. There he documented the hardships of Berliners' daily lives. Browse some of these images. 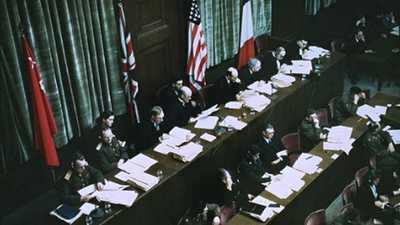 Although the League of Nations and other international meetings had used simultaneous interpretation prior to the trials at Nuremberg, its successful use there in 1945 gave the method new importance. 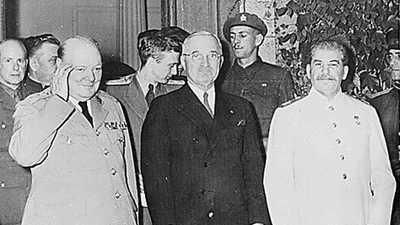 The 1945 meeting betwen the Allied partners underlined the differences between them, and set the stage for a post-war "cold" war that would be waged in the coming decades between two global superpowers. In 1864, twelve nations signed the first Geneva Convention, which guaranteed neutrality to medical personnel. Such conventions have grown into a set of internationally recognized principles. In the Moscow Declaration of October 1943, United States President Franklin D. Roosevelt, British Prime Minister Winston Churchill, and Soviet Premier Joseph Stalin formally stated their determination to bring Nazi war criminals to justice. 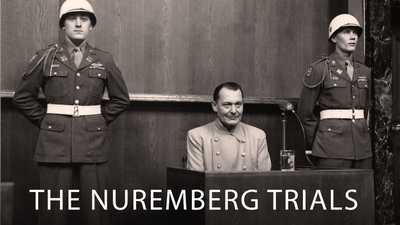 The chief prosecutors for the trial of Nazi war criminals at Nuremberg came from four nations: The United States; The United Kingdom; The Soviet Union; and France. On October 18, 1945, the United States, Great Britain, France, and Russia issued an indictment against 24 men and six Nazi organizations. Each of the four Allied countries that had formed the International Military Tribunal provided one judge and one alternate for the court that convened in the fall of 1945. 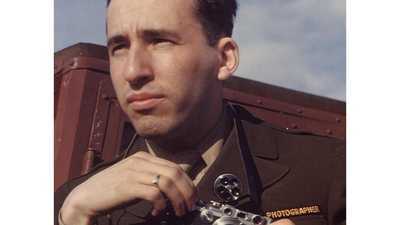 Raymond D'Addario took hundreds of black and white and color photographs at Nuremberg for the Army. William Glenny guarded the Nazi defendants. Read their reminiscences about the trials and their work there. Read about key events of World War II, and its aftermath.